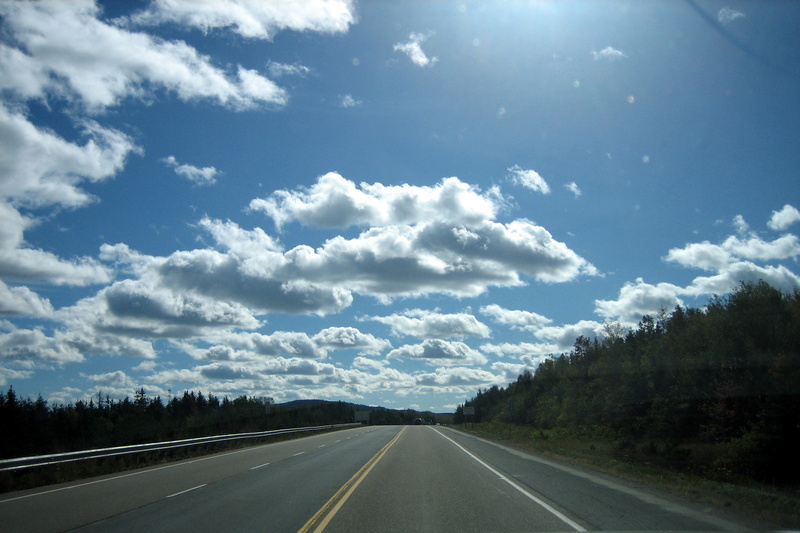 Sunday, October 10, 2010: Up early and on the road to Nova Scotia. The weather is overcast with a light wind and the current temperature is 7 degrees. That’s funny…..it only feels like 45 degrees or so. We must be getting used to the cooler temperatures. We drove up NB 114 through the town of Beaver Brook to Hopewell Cape where the famous “flower pot” rocks reside. 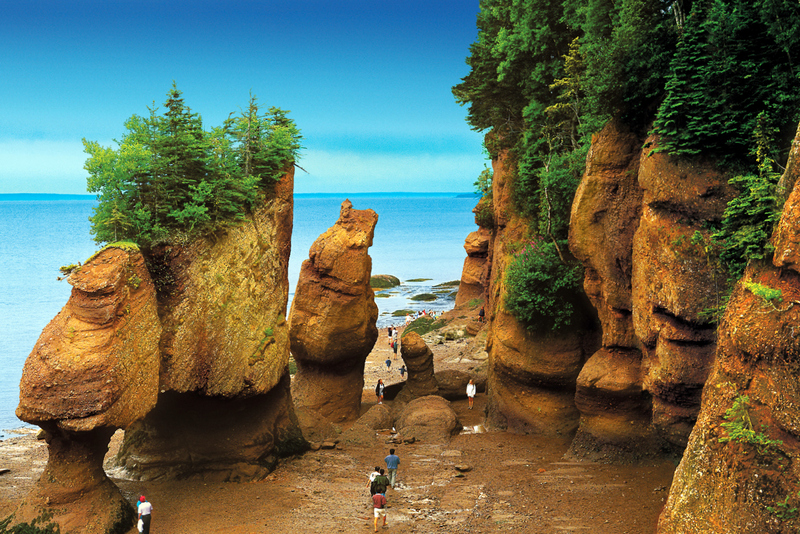 Since we had walked among them on a previous trip and since it was high tide and we can’t hold our breath very long we didn’t pay to go into Hopewell Rocks National Park. However here is a picture of the rocks captured from the internet. We soon came upon a sign “Tidal Bore Park”, so had to investigate. A tidal bore is when the fast rising tide in the Bay of Fundy rushes up a river, in this case the Petitcodiac and creates a standing wave that travels upstream. However this only happens at select times of the day and when we drove by the area it looked like a lazy river. Wonder if the park sign was misspelled? The river however was a rich chocolate brown color due to the churning of the water during the tidal bore’s advance. Pulling into the city of Moncton we stopped for fuel and then hopped on the Trans Canada Highway (TCH)-2 headed for Nova Scotia. The TCH is similar to our Interstate Highway system and although we prefer to stick to the back roads sometime we don’t have a choice. Entering the province of Nova Scotia under sunny skies we stopped at the very nice visitor’s center for maps and information. They even had internet capable computers set up for travelers use. So as Kit checked e-mail and Facebook I gathered the information on where to go and what to see. Tired of the TCH we decided to take the coastal route NS-6 toward Pugwash through Malagash and on into Tatamagouche where we jumped on NS-104 toward Antigonish. Yep…..we learned to pronounce all those town names. Since it was nearing 1700 we decided to remain in town for the night. We pulled into Whiddens Campground, a nice family run park in the center of the village. 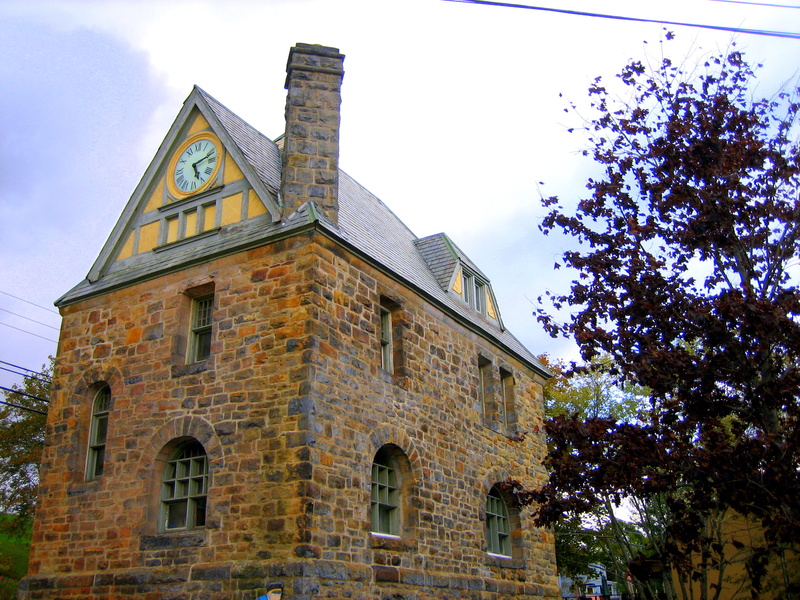 Monday, October 11, 2010: On the road at 1030 and drove through Antigoish which was a pretty little town with a traditional downtown area full of shops, offices and restaurants. We will likely stop there on our return trip and spend some time oz’ing around. We then jumped on the Sunrise Trail (NS-6) heading East. After our conversations with the nice folks at the Visitors Center yesterday we decided the town of Baddeck would be a nice and convenient home base for our exploring this part of Nova Scotia. We crossed over the causeway onto Cape Breton around midday and drove through many picturesque villages amongst the rolling hills. 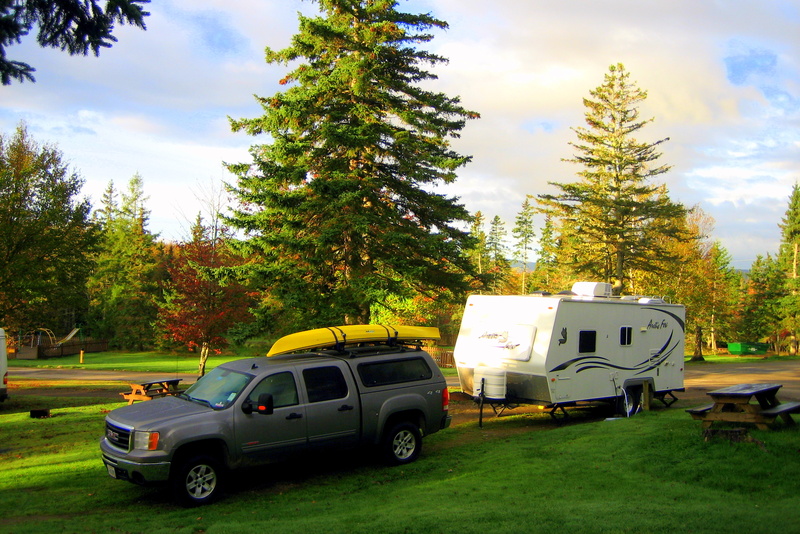 Arriving at Baddeck we decided to stay at the Baddeck Cabot Trail Campground which coincidentally was right on the world renowned Cabot Trail. The campground was very nice and clean and run by an interesting couple originally from Bavaria by way of British Columbia. We selected a nice site and then I disconnected the truck, leveled and stabilized the trailer, connected all the utilities and proceeded to start the laundry in the campgrounds nice facility. Yep…..you know what came next. Miss Kit proceeded to inform me that the laundry was her domain and that I should—– BACK OFF! I guess I didn’t help matters by saying, “why don’t you change out of your cranky pants so I can wash them as well?” It’s amazing how a plastic laundry basket can be hurled across a Laundromat and strike my noggin with such force. 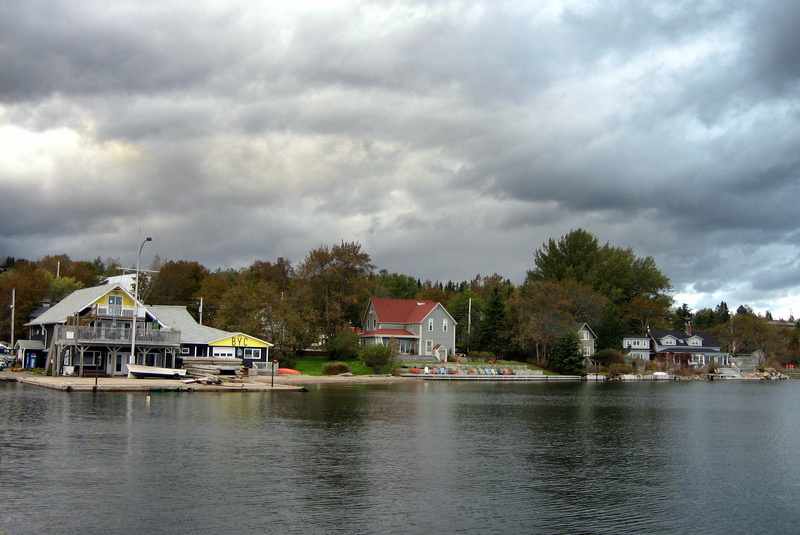 In order to regain some peace and prevent me from having to sleep with one eye open I suggested we go into the town of Baddeck to do some shopping and have a meal. After a few gift shops Kit said I could go off on my own so I went to the waterfront and shot a few pictures. Rejoining, we had a nice meal in a small restaurant called the “Yellow Cello”. Continuing our walk we came to this interesting building which housed the town’s Interpretive Center which was unfortunately closed for the evening. 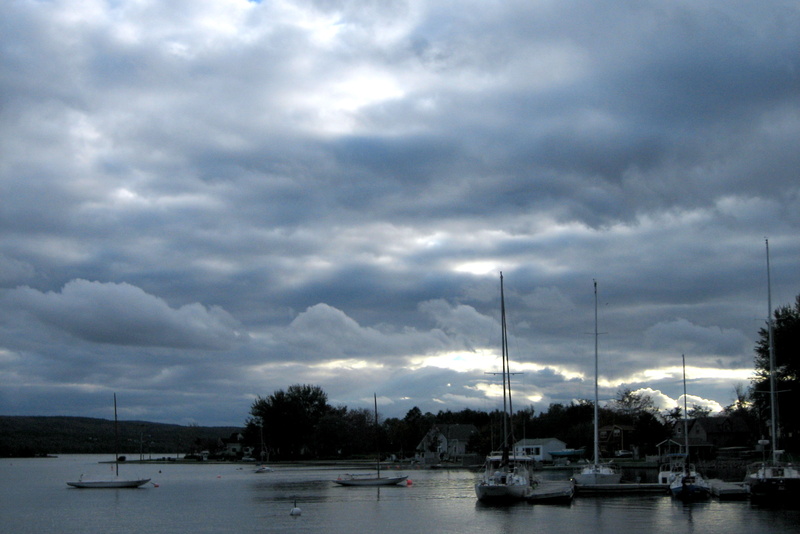 Tuesday, October 12, 2010: Woke to sunny skies, puffy white clouds and light winds. Perfect to drive the 185 mile Cabot Trail loop up and around the Cape Breton Highlands. Funny thing is that the trail built in 1932 was named for explorer John Cabot who was thought to first view the area in 1497. It was only recently learned that he actually made landfall in Newfoundland. We left the campground at 0830, stopped in town for some fuel and headed up the western side of the cape to allow driving on the portion of the road that was closest to the guardrails. Unfortunately that put Kit closer to the precipice than I which I was reminded of often. The rugged coastline and close proximity of the trail to the cliffs provided spectacular views. Just north of Wreck Cove we noticed a few cars pulled over at a turnout and the occupants had cameras and binoculars trained on the ocean. So naturally we joined the herd and what did we see? The picture isn’t very good but that is indeed an American Bald Eagle! 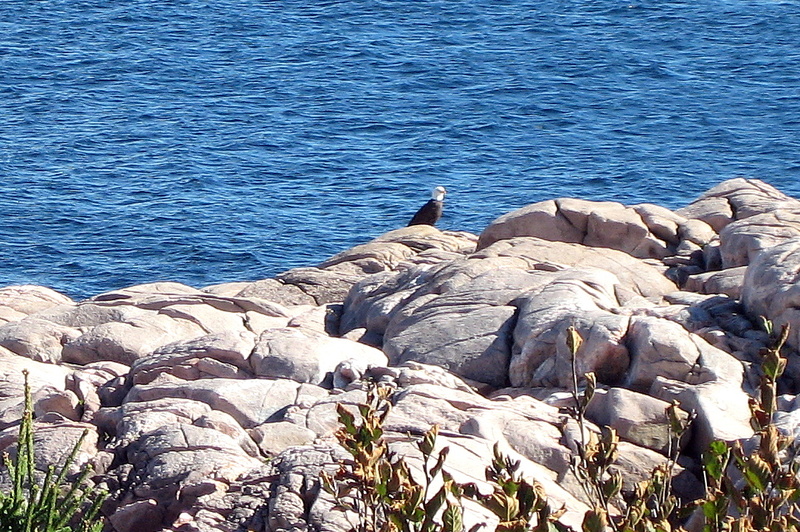 Or probably more accurately a North American Bald Eagle. He was sitting on the rocks pretty as you please and appeared to be posing for us. After a few minutes the majestic bird spread its wings and took flight circling over the blue waters of the Atlantic Ocean. Before I close this issue I wanted to note that there are “pointy roads” in Nova Scotia as well. This one was right before entering Cape Breton Highlands National Park which the Cabot Trail traverses through as it makes its journey up the western shore around the northern tip and down the eastern shore. 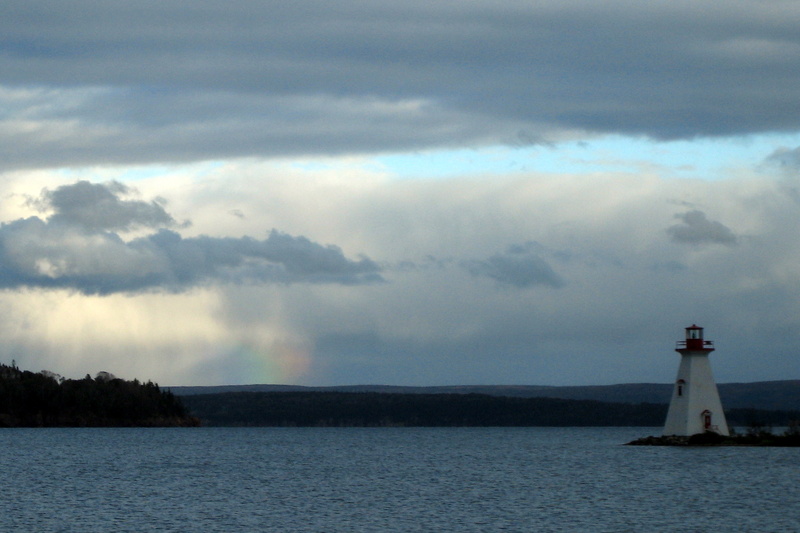 Stay tuned for the next issue…..Adventures on the Cabot Trail.